Who doesn’t love fresh plump peaches in our summer desserts each year? Many of us look forward to it and have fond memories that go all the way back to our childhood of favorite peach desserts our grandmother’s made for us. Skillet Peach Cobbler – The campfire and a cast iron pan are all the tools you’ll need to make this delicious dessert for your group of campers. You’ll be combining eggs, milk, vanilla, to flour, sugar, baking powder and salt. The batter goes into the hot skillet and the fresh peach slices are dropped on top. You can dollop peach preserves on it as well and, once cooked, top it with whipped cream or a scoop of ice cream. Delicious! Peach Crisp – This combination of peaches and granola can be made for breakfast or dinner, depending on your mood. You’ll mix up some flour, sugar, butter, salt, and butter to form a crumble. This will be sprinkled over the top of peach slices in a baking dish or cast iron skillet and cooked until done. Eat it warm for dessert or cold for breakfast with a dab of yogurt. So very good. Fried Peaches – Forget coconut shrimp, these are going to be your new favorite. 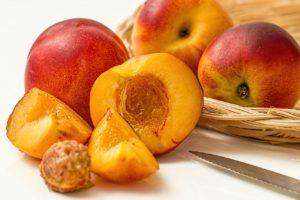 All you’ll need is some plump peaches, flour, eggs, oil, and panko bread crumbs, You’ll dredge the peach slices in egg, flour, and the panko and then drop them in the oil. Better plan to make extra. These are going to go fast.